The perfect way to help expand your child's vocabulary! Young children beginning to learn new vocabulary will delight in this bright and engaging book featuring 500 clearly labeled illustrations - from colors and animals to vehicles and food! A must-have for any home or school library. Established in July 2013 in a merger between Penguin and Random House, Penguin Random House, with nearly 250 independent imprints and brands on five continents, more than 15,000 new titles published each year, and close to 800 million print, audio, and eBooks sold annually, is the worlds leading trade book publisher. Like its predecessor companies, Penguin Random House is committed to publishing adult and childrens fiction and nonfiction print editions and is a pioneer in digital publishing. Its publishing lists include more than 60 Nobel Prize laureates and hundreds of the worlds most widely read authors. Kristin Kest is an artist and illustrator. She has illustrated numerous covers and interiors for books and for adults and young readers. She received an MFA at the Maryland Institute College of Art and teaches illustration and other courses at York College of Pennsylvania. 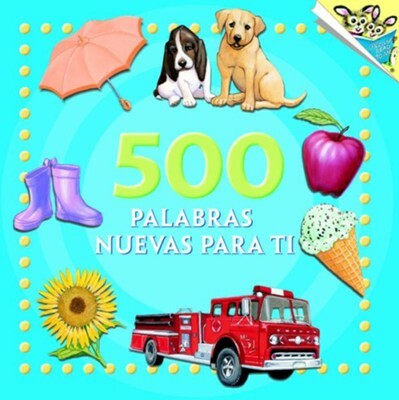 I'm the author/artist and I want to review 500 palabras nuevas para ti.